Star Struck Clothing – Sparkle On! Reproduction Flexible Sandals and Heels! Reproduction flexible sandals are Available Now! We are so proud to announce that our Finish Line Handbags are now available and ready to ship! We are seeing the checkered flag with our Finish Line Collection! Made from Sparkle and Checkerboard vinyl, it is the perfect compliment to any outfit! This handbag features a double pull zipper, lined with a sturdy cotton and inside you will find a large inside pocket and an inside zipper pocket. Measures 14 inches long, 8 inches tall and 5.5 inches wide. Strap drop measures 9.5 inches. 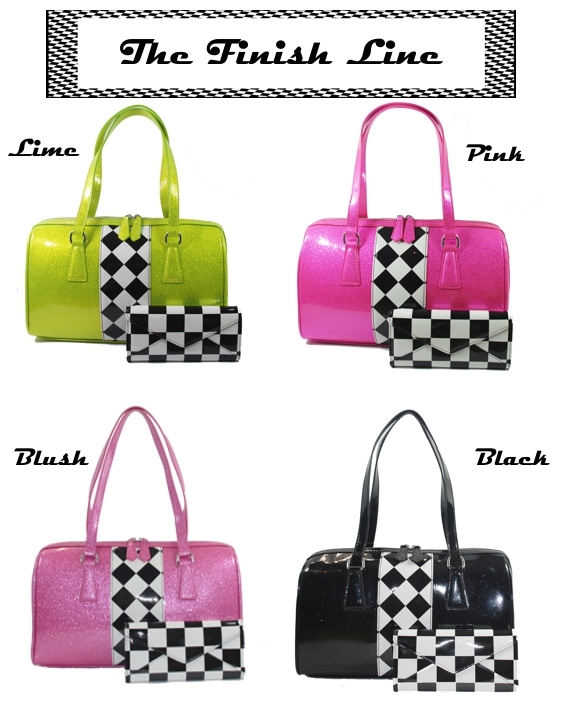 This bag comes in Pink, Blush, Black and Lime Green Sparkles and matching Checkerboard wallets are available!